All you need to start your own kombucha is non-oily sweetened tea (like black, green or oolong) and SCOBY (a symbiotic culture of bacteria and yeast). 4 tea bags (containing no oil — just plain black, white or green tea). Create your own blend by combining one or two of each. 1. Sterilize all materials (jars, bottles, spoons, etc.) before using them. 3. Pour boiling water into the glass jar, add tea bags and let the tea steep for 20 minutes. 4. Remove tea bags and mix in the sugar until it’s dissolved. 5. Cool to room temperature (this takes about two hours). 6. Add kombucha starter or vinegar, and SCOBY to the jar. 7. Cover jar rim with a small, clean cotton towel and seal it on with a rubber band. 8. Place the tea in a dark and warm environment (ideally 72 to 80 degrees F) for seven to 14 days. 9. 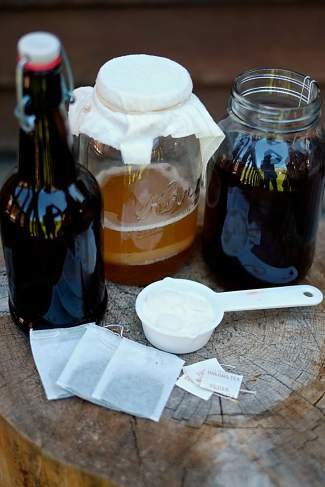 Remove the SCOBY and add it to vinegar or any leftover kombucha for your next batch. 10. Bottle the kombucha with any added flavorings (fruit, ginger, etc.). 11. Let sit for three to seven days before placing bottles into the fridge. This is when you have the option of straining added fruits, or leaving them in. Once the tea is placed in a refrigerator, it stops producing carbon dioxide, so the longer it sits in a warm environment, the more bubbly it will be, and the more vinegary it will taste. The pancakes that Avon resident Andrea Koehler makes in her kitchen are not your classic flapjacks. Koehler has been making her own kombucha batches since 2012. She said she had been spending $3 to $5 per bottle when she started drinking it in 2007 in Seattle, and now that she consistently makes it herself, she said she finds it both financially and physically beneficial. After start-up material costs, she said it now costs her an average of 35 cents a bottle. She shared how she didn’t get sick at all in the first year that she was making and consuming her kombucha and that she notices her energy level is higher when she drinks it. Kellie Krasovec, owner of Kellie Krasovec Acupuncture in Edwards, said that while she enjoys any beverage with bubbles in it, consuming kombucha clears her head. A much better option than drinking coffee and then crashing, she explained. Krasovec has been making kombucha since the late ’90s when she lived in Boulder, before its popularity hit the mainstream. Beyond the bubbles, she said kombucha helps aid healthy digestion, providing natural enzymes and probiotics to help break down food and absorb nutrients. Ben Henson also makes his own kombucha at his home in Eagle-Vail. Henson said a kombucha drink offers the carbonation that soda drinkers often crave. He likes adding berries and a lot of ginger, sometime candied ginger, and lime and lemon to his kombucha batches. Kombucha’s benefits are the same that a consumer will get from cultured vegetables, explained Delling Zing, owner of Freshies Organic Foods in Edwards. While he agrees that drinking a kombucha is better than drinking a cola, Zing said that the sugars in flavored versions of the drink can outweigh the benefits of the cultured part. “But compared to a Coke or another sugared, caffeinated beverage, this is much better, giving you a natural energy lift from the B vitamins and the enzymes,” he said. Since SCOBYs multiply, most new kombucha brewers obtain their starter culture from others who already makes their own batches. Krasovec said if you don’t have access to a SCOBY, use some store-bought or homemade kombucha as a starter — an option that takes a little longer. Find someone who makes his or her own batches, however, and you should have no trouble finding a SCOBY starter. Each culture creates its own colony, new SCOBYs, to make continuous batches of probiotic refreshment.